In June of 2016, Pittsburgh’s Urban Redevelopment Authority (URA) purchased Hays Woods land and mineral rights from Pittsburgh Development Group II for $5 million with the intention that it would become the city’s largest urban park. Following through on that plan, the URA Board voted in November 2017 to sell the majority of the land to the city of Pittsburgh for $1 (title transfer pending). However, they withheld 89 acres at the north end of the site for a possible residential development (blue outline in the map above). In December of 2017, The Department of Conservation and Natural Resources (DCNR) awarded a $800,000 grant to URA to help defray costs of the site’s purchase. In early 2018, Richard King Mellon Foundation gave $2 million to Western Pennsylvania Conservancy (WPC) on behalf of Hays Woods; WPC gave that amount to the URA. In April of 2018, Pittsburgh Mayor Peduto ordered the formation of a task force to consider the design of Pittsburgh’s future Hays Woods park. The 21 member group is composed of members of the community, environmental advocates and foundation representatives. Task Force committees will consider the environment, trail development, programming and education. Their original thinking can create a plan in which the people of the city can benefit from the natural attributes of Hays Woods. 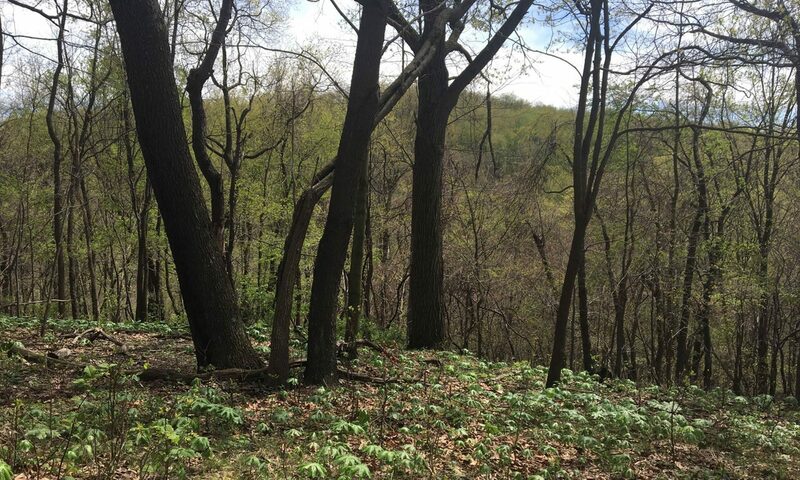 Prior to the URA’s purchase, Hays Woods was owned by Pittsburgh Development Group II (PDG), who bought the land in 2003 for $1 million to develop Pittsburgh Palisades Park. Anticipated build-out was to last 20 to 30 years and include a thoroughbred racetrack, casino, commercial area and residential homes. Preparing the site for development would have involved deforestation and coal mining using mountain top removal (MTR) mining methods. To level the site, the forest’s hills would have been excavated to depths of up to 200 feet and the overburden used to fill in stream valleys and wetlands. The overall elevation of the site would have been reduced by 90 feet. The Palisades Project was challenged by local environmental groups, the Department of Environmental Protection, the U. S. Army Corps of Engineers, the Pennsylvania Game Commission and other agencies. The project’s mining and gaming permits were denied. In 2009, PDG’s appeal was also denied and the project halted. Jones and Laughlin Steel Corporation (J&L) purchased Hays Woods and consolidated ownership of the farms and coal and gas mines in the 1930’s. A research laboratory was established on a small portion of the site. In 1974, Long-Temco-Vought Corporation( LTV) acquired J&L and the laboratory was closed. The laboratory and it’s grounds were sold, and the site is now a private academy. Although overhead power lines and underground gas pipelines cross the property, Hays Woods remained unused by industry for many decades. In 1988 LTV Steel sold Hays Woods in bankruptcy court to DGD Realty for $2.71 million. One of the earliest recorded uses of Hays Woods was a farm established on the wooded plateau by Samuel Hays. Later, his daughter married, and the Glass Farm shared the highland above the Monongahela River. Below the bluffs along the river, a community developed. The Six Mile Ferry crossed the Monongahela near the mouth of Streets Run to connect to the community of Glenwood. Hays Woods was rich with bituminous coal, and the Hays family had several operating drift and deep shaft mines. Western Pennsylvania’s first modern inhabitants were members of the Shawnee and Lenape Indian tribes. Arrowheads and tomahawks from these nations have been found in the Baldwin area. Eventually these tribes, which were friendly to white settlers, were overcome by the Iroquois Nation around the time of the French and Indian War (1754 until 1758). In the 1700s, French and English fur traders were active in the area. From 1700 to 1800, most of the colonial settlers were farmers. They traded produce and livestock and supplemented their food supply with the region’s plentiful game and fish.